The following is a fantasy piece constructed for the PWHS! In 2001 the WWF purchased WCW and ECW from their respectful owners. ECW owner Paul Heyman joined the WWF before ECW's last event even took place, as Jerry Lawler's replacement as color commentator. Original plans for the brands backfired, (AND IT'S ALL DUE TO THAT NO GOOD LOUSY EGG SUCKIN DOG BUFF BAGWELL), so an Invasion angle was planned. It lasted until November and it sucked! So, here's my Invasion! So sit back in your favorite chair, warm up the VCR (HA!) and enjoy this fantasy piece from The Sheaster! Eddie Guerrero, Chris Jericho, Tazz, and Raven beat The Hardy Boys and Edge and Christian. After the match, Buh Buh Ray Dudley, D-von Dudley, Spike Dudley, and Rhyno, attack The Hardys and Edge and Christian. Guerrero, Jericho, Tazz, and Raven back off The Dudleys and Rhyno, only to attack the Hardys and Edge and Christian themselves! The eight of them then shake hands and leave! Steve Austin Vs. The Undertaker ends in a no contest when Booker T, Lance Storm, and Mike Awesome, attack Austin and The Undertaker! Then, out comes Eric Bischoff, and he declares war on the WWF! The Rock calls out Austin! Instead he feels...the...BANG! DDP out of nowhere with a Diamond Cutter! The Dudley Boys beat The Hardy Boys and The APA in a three way tables match! Afterwards The Dudley Boys are joined by Spike, Rhyno, Raven, Tazz, Chris Jericho, Eddie Guerrero, Justin Credible, and Jerry Lynn! The Dudley Boys say this is just the beginning, and out comes Paul Heyman! Heyman says, The War just got Extreme! The APA are in the ring and they call out WCW! From behind, KRONIK(Brian Adams and Bryan Clark) hit the ring and take out the APA! Too Cool are in the ring, but get attacked by Rob Van Dam and Tommy Dreamer! Hugh Morris debuts and beats a local preliminary, and is asked what side is he on! He says he's on the side of Hugh Morris! The Rock wants Austin to come down to the ring, but once again he gets DDP instead! They brawl until Austin's music hits and hits stunners on both men! Then... N.W.O.! Hogan, Hall, and Nash make their way down and attack Austin, but, the lights go out! They come back on and Sting's in the ring! He's got his trusty bat with him, and he points it towards the crowd. Through the crowd comes, Ric Flair, Goldberg, Terry Funk, and DDP had recovered; all of them hit the ring and everybody brawls to end the show! Raven beat Kane in a Raven's Rules match. Chuck Polumbo and Sean O'Haire debut and beat two local guys. Rob Van Dam beat Brian Christopher. The Undertaker calls out WCW and Mike Awesome answers the call. Awesome gets tombstoned! Then...Triple returns, first time he's been seen since WrestleMania 17. He says he's ready for a war! Eric Bischoff comes out and says, that's good because the war was about to get interesting...THE ROAD WARRIORS...OH WHAT A RUSH, fills the arena and they come out and destroy Triple H to end the show! The show opens up with Vince McMahon. "This company, The WWF, was started by my father. Now it's under attack from two different companies. WCW and ECW. I will not sit back and watch my company die! ERIC BISCHOFF, PAUL HEYMAN, YOU WANT A WAR? YOU GOT ONE!" Half an hour later, Michael Cole tries to interview The Rock backstage, but, he gets tapped on the shoulder, and when he turns around he is shocked by who he sees...Mean Gene Okerlund! "Step aside jabroni! I'll take it from here," says Gene as he begins to interview The Rock. Twenty-five minutes later: Paul Heyman has something to say, but, Shawn Michaels returns and gives Paul Heyman sweet chin music! At the end of the show: Jerry Lawler is in the ring, and he says he has a surprise for everyone. However, Eric Bischoff comes out and says he also has a surprise. THE STEINER BROTHERS! They hit the ring and are about to attack Lawler, but his surprise shows up! 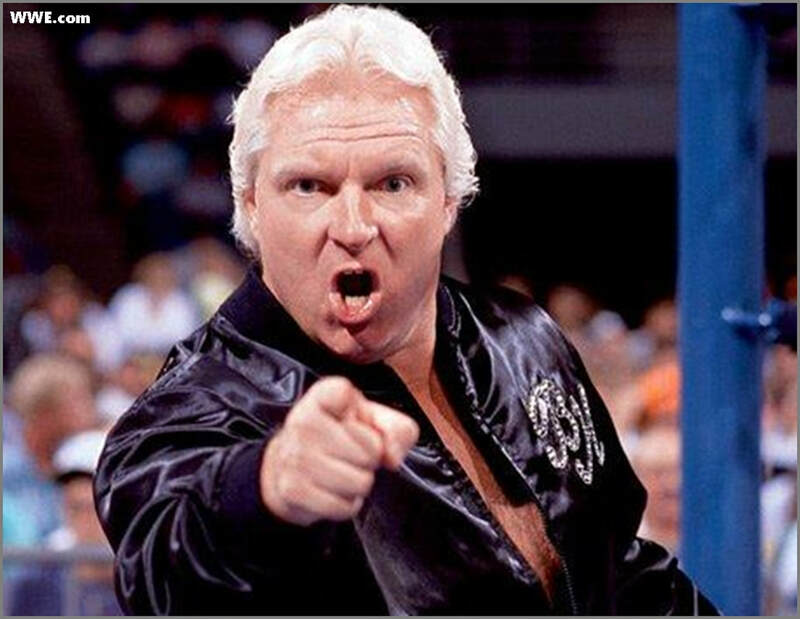 BOBBY THE BRAIN HEENAN! Bobby has returned to the WWF! "It's good to be back. I missed the WWF. I missed the WWF fans. I'm sure you all missed me too. Hey Jerry, been a long time my friend. Hey, you want to know something, Jerry Lawler, back in 1993, went to Vince McMahon, and you know what he said to Mr. McMahon? He said, that Bobby Heenan, he's looking old. He's looking wrinkled. He said Bobby's looking washed up, I'm younger than he is, I can do better. Bobby tells the same tired jokes all the time, I'd never do that. That's what you said, right Jerry? Hey! Don't deny it! LET ME TELL YOU SOMETHING, PAL! I was in this business while your father was still chasing your mother around the sock hop! I know more about this business then you'll ever know! You think bringing me here, I was just going to sit next to you every week and listen to your lame jokes, you were sadly mistaken! And guess what Jerry, I'm not the only one who hates your guts! So does this man..."
Well, it's the BIG SHOW! Big Show comes down and takes out Lawler! Show and Heenan leave together to end the show! Eddie Guerrero and Chris Jericho beat Edge and Christian (c) to win the titles! The Dudley Boys declare themselves the ECW World Tag Team Champions, and will defend them against a team of fellow ECW roster members! The Dudley Boys beat Tazz and Rhyno by Disqualification after The Hardys interfere. The Hardys challenge The Dudleys. They accept, match is made for the INVASION PPV in 2 weeks. PLUS - The NWO will be there! Ric Flair will be there! Sting, Goldberg! And More! The Best is yet to come! Find out what happens in the next #FantasyFriday! Until next time PWHS! Save me a ringside seat! #FantasyFriday: Chapter Three - Read Here. #FantasyFriday: Chapter One - Read Here. Other articles by Shea can be Read Here.